Choir competitions were a regular feature in the diary when the choir started. It was an effective way of getting its name known and its reputation established. These days, choral competition has become less fashionable and of reduced importance as a publicity method, due to the widespread availability of electronic means to publicise its activities, such as this website. Kelkheim in Germany is twinned with High Wycombe and reciprocal choral events have taken place to cement this bond of friendship. 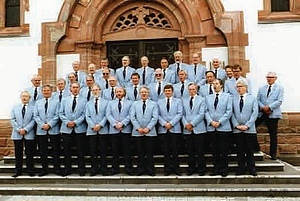 In 1998, Kelkheim Choir invited the Orpheus to perform in Germany. This photograph was taken outside Kelkheim's famous monastery. 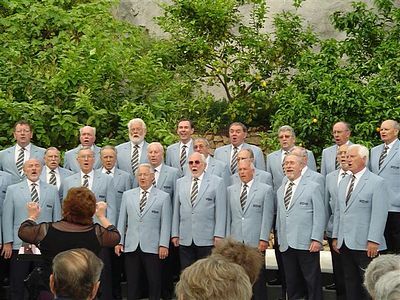 In recent years, the choir has been fortunate to sing in many stunning locations, some of which are almost genuine ‘one-offs’, such as the Eden Project Mediterranean Biome, and The Millennium Centre in Cardiff. The choir’s reputation for high choral standards and consistent performance quality has resulted in regular invitations to sing at extremely prestigious events. 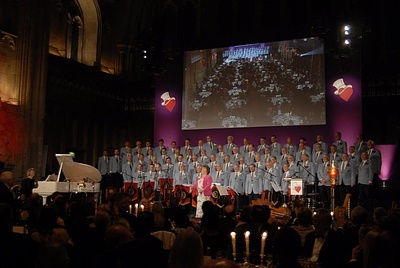 These have included The Festival of Male Choirs at The Royal Albert Hall, The Variety Club of Great Britain Annual Awards Ceremony at The Guildhall in London (before royalty), and best of all – as far as many members are concerned -The Miss World Gala Charity Dinner at The Grosvenor House Hotel, Park Lane. All the lovely competitors - more than 100 in number - mixed with and entranced the Orpheus choristers. The occasion was a spectacular success, and The Orpheus received a standing ovation for its performances of African Prayer and You’ll Never Walk Alone. The Orpheus has also appeared at Llandaff Cathedral in Cardiff and Peterborough Cathedral in recent years to great local acclaim. It continues its programme of concerts, principally for charity, with up to a dozen concerts a year with the main choir and many more by the smaller groupings formed to perform at venues or events which will not accommodate the full 60-plus on-stage choir. The Orpheus at The Variety Club Annual Awards Ceremony at The Guildhall, 5th May 2009. As you can see, there is not a vacant seat. The Orpheus accompanist is Mrs. Thelma King, and Louise Langley has the audience ‘eating out of her hand’! 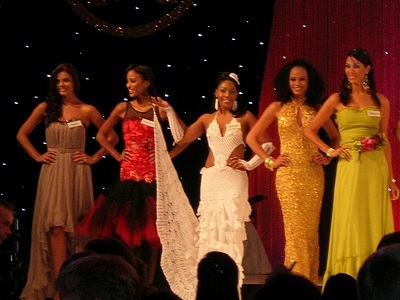 The Miss World Gala Dinner November 2009 – all seats were taken at £200 per head!